I am back today with a new project using the beautiful MALIBU TN kit, what can I say, the Pink Paislee’s Summer Lights collection is gorgeous, and all the add ons are perfect to document summer, and those special beach adventures. 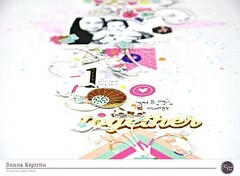 The starting point for this layout were the exclusive cut files from last year’s summer and August kits. Once I had cut them on white cardstock, i wanted to add color to the page, something very summery and bright. Using a combination of heavy acrylic paint, i dragged the paint across white cardstock, and soften the look of the streaks with a large brush, and a baby wipe. Then stitched the page to one of the Elle’s Studio papers from last month’s POOL PARTY KIT. The ring cut out also was sewn to the page, and then i used the Pink Paislee papers from the Malibu TN kit to back the flower cut out. I love the rich colors in the papers, and how they contrast beautifully against the bright background. The flowers were then attached to the background using a bit of foam adhesive. I positioned them so that they were framed by the long leaves from the ring cut out. I added the long leaves from the Fancy Pants Hello Sunshine ephemera pack included in this month’s kit. The title for this page comes from Pink Paislee’s Summer Lights ephemera pack -which can be found in the Malibu Main Kit -. I love this page, the colors of the papers in the Malibu TN kit matched the bright green color of the background, and bring the eye to the subject of the page. It was so easy to complete the page using the kit, and a few of the exclusive cut files available at the Digital Store. There is a lot of goodies available at the store, so take some time to visit it to check them all out. Remember to contact me, if you have a question about how this page came together. Categories: Art Studio, Locker Room, Study Hall | Tags: beach, ck cut files, CK Exclusives, Design, Malibu TN kit, mixed media, Nathalie DeSousa, pink paislee, Pool Party Kit, scrapbooking, summer, Summer Lights | Permalink. Beautiful work! Love that green background! This is just so beautiful. I love all the cutfiles you used on this! !